What was founded as an electrical shop in 1910 by Namihei Odaira in Japan is today a world leader in power tool production. Hitachi limited has it all for its customers- electronic gadgets to IT solutions & even jigsaws!! 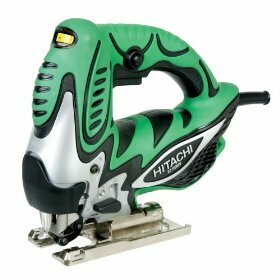 Hitachi Jigsaws are powered tools which are a must while carving & cutting patterns on wood or any other tough materials. They may come with an assortment of blades to match the cut requirement. The Hitachi CJ series seems to be the only series consisting of 3 models which are all successful even currently. The body of each jigsaw by Hitachi is designed keeping in mind the user's comforts & nominal usage & planning of space taking care not to make the tool extremely bulky or neither too flimsy. The material used to make these jigsaws are monitored by Lean Six Sigma standards ensuring that their pinnacle of quality maintenance is met. Including the normal features like rock solid stability, prolonged durability, extremely smooth cuts, low or no vibrations these jigsaws come with an inexplicably excellent grip, which gives the maximum precision during cutting. Not to forget the abundant power, this slices any material with at most ease & the tool free blade changing system. It has a solid metal base which is robust & strong ensures that the tool is well settled on the cutting surface. The in-built lights & the dust blowers' help in see the line of the cut accurately, even in poor environmental conditions. And of course, the L.E.D light is surely a good thing. One important aspect that most other brands in the market lack are Hitachi's value for money & the warranty cannot be compared. Though there is nothing much in a Hitachi jigsaw to nurture the user's whims & fancies it sure does have everything a hard working, long lasting machine should have. And as for the guarantee, it is rare that any product gives a 5 year warranty on all the features of a tool that would be exploited to the maximum almost on an everyday basis. As in every product even these jigsaws seem to have their own share of drawbacks, although it's nothing major. For one thing, all of these jigsaws seem to come with only a single speed. This lowers the control when working on accurate cuts. Though there is a keyless blade changing system, the adjustment triggers do not seem sturdy enough to last for a long time when they are handled roughly on a daily basis. One particular model in the Hitachi CJ series jigsaws has a roller wheel (the part that supports the blade) that is not strong enough to withstand pressure when it is cutting dense materials of varying thicknesses, thus breaks off during the working process itself. Overall Japanese are the best in cell phones, the best in robots & one of the best in jig saws!! Return From Hitachi Jigsaws Page to Home - Finishcarpentryhelp.com.